The pageant that arises from the sea had its beginning five years ago when maritime and pleasure-boating leaders realized that the glories of the ancient Hellenic gods who once dwelt on cloud-capped Olympus have faded in men's minds. Their gaze turned to snow-capped Mount Olympus, a peak in the Olympic Mountains on the peninsula west of Seattle. "There is the new Olympus," they said, filled with civic pride. "There dwell the old gods in a new world. Most restive and bored is Neptune, King of the Seas, who must sit there and watch ships of the world enter Puget Sound from the Pacific Ocean through the Straits of Juan de Fuca. Let's throw a party and invite him down here." Apparently Neptune's thoughts were running along the same lines, for he was pestering Jupiter for shore leave. 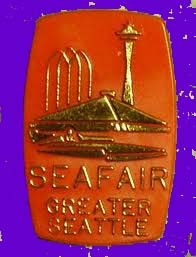 He grumbled something about the Pacific Fleet knowing Seattle as a good liberty town and that it was a sin and a shame he, too, couldn't hit the beach at least once a year. 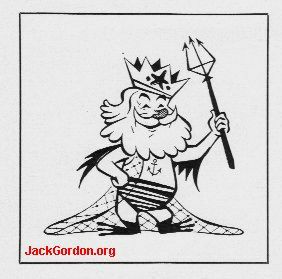 Jupiter, whittling away at a lightning bolt, suddenly twisted it into a trident and handed it to Neptune. "Go," he said, scribbling out a 10-day pass. "Take this trident forged from Olympian lightning, symbol of your power, and buckle on your shield bearing the images of the Horse, Dolphin and Pine Tree which, are sacred to your name. Walk among the mortals and bid them deck the Port of Pleasure in festive dress. Let the carnival be like unto Fiddlers' Green, that Elysian Field of sailors where credit is good and there is always a lass, a glass and a song." As the legend goes, the first thing that Neptune does when he hits port is to send his subject dolphins to the bottom of the sea to invite the captives of Davy Jones' locker to the carnival in the Port of Pleasure. This irks Davy Jones and his No. 1 "torpedo," Captain Kidd, who declare war on Neptune and stage an attack on Seattle and Neptune's realm which continues until the final curtain drops on the 10-day funfest. 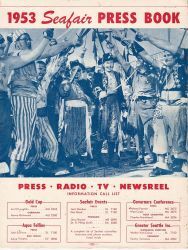 The Legend of Seafair, written by Jack Gordon of Greater Seattle, Inc., is from this 1953 Seafair Press Book.